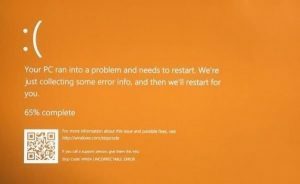 The Windows 10 Orange Screen of Death, unlike Blue Screen of Errors, is quite an uncommon error where the hardware is the culprit which is mostly caused by some issues with the GPU. If you are currently facing this problem, then you’ve come to the right place as this post will guide you on what you can do to fix it. There have been reports from users that the Orange Screen of Death is caused by various reasons. Some users reported that they encountered Orange Screen of Death when they were watching a YouTube video, while some were not able to boot into their Windows 10 PCs and encountered an error instead that either says, FAULTY_HARDWARE_CORRUPTED_PAGE or WHEA_UNCORRECTABLE_ERROR error. In addition, this error can also occur when your computer wakes up from Sleep or while using BitLocker or while you use a second monitor. Whatever the case is, you can try updating your drivers or lower the clock speed of the GPU. 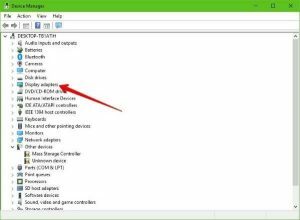 You could also try to fix the DRIVER_IRQL issue in case it’s the one that triggers the error or perform Automatic Repair or uninstall any recently installed software. First, boot your computer into Safe Mode. After that, tap the Win + R keys to launch Run. Type in msc into the box and tap Enter or click OK to open the Device Manager. After that, a list of device drivers will be displayed. From there, look for the Display Adapters and click on it. After that, right click on each entry under the Display Adapters and select the “Uninstall Device” option from the menu. After restarting your computer, go to the Settings app and Check for Updates in the Windows Update section. Note: You also have the option to go directly to the website of your graphics card manufacturer like NVIDIA, Intel or AMD and go to the section called Drivers then check if there’s a new available update – if there is, download and install it. If you have installed a software or two recently and then suddenly encounter this Orange Screen of Death, then they are most likely the culprits. The best thing you can do is to first check the System Log in the Event Viewer for any additional information in case it’s not the GPU but some other driver or device that’s causing the error. Once you have identified the culprits, uninstall them and see if the error is fixed. If overclocking is enabled, you might have to disable it as some users reported that the WHEA_UNCORRECTABLE_ERROR 0x00000124 error started to appear right after overclocking. To disable it, follow the steps below. Go to the Start Menu and open Settings. Next, select Update and Security and go to the Recover tab. From there, click on Restart now in Advanced startup. This will restart your computer. Once you’re in the Advanced startup, go to Troubleshoot and then select the Advanced Options. From there, select the UEFU Firmware Settings. Now click on Restart. Once your computer has restarted, it will automatically open BIOS. From the BIOS, go to the Advanced tab and navigate to Performance and then look for Overclocking. Once you’ve found Overclocking, make sure that it is disabled. If it’s not, then disable it and then save the changes made by tapping the F10 key. Start your computer normally and check if the WHEA_UNCORRECTABLE_ERROR 0x00000124 error is now fixed. Type in the keyword “Verifier” in the Cortana search box to search for Verifier in Windows 10. After that, select the option “Create custom settings”. 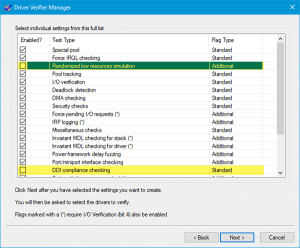 Make sure that you have checked everything except the options “DDI compliance checking” and “Randomized low resources simulation”. Next, select the option “Select driver names from a list” option. 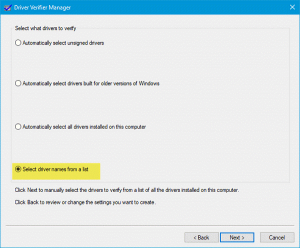 Afterwards, you have to select all the drivers from any unofficial or third party provider. To simply put it, you have to select all the drivers that are not supplied by Microsoft. The command you just executed will display the Driver Verifier settings so if you see any of the flags enabled boot your Windows 10 PC into Safe Mode. The command will reset the Driver Verifier. Once the process is done, restart your PC and check. You might also want to use Automatic Repair in fixing the error. To do so, follow the steps below. You can start by creating and booting from a bootable Windows 10 USB Stick. After that, click on Repair your computer located on the bottom left corner when you are on the initial Windows Startup screen. 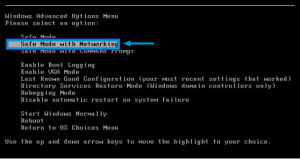 Next, click on Troubleshoot and then on the other screen, click the Startup Repair option. Now select the operating system you want to repair. Once you do that, it will start to repair your operating system. Wait until the process is completed and then check if the problem’s now fixed. If none of the solutions given above fixed the Orange Screen of Death error, worry not for there is still a one-click solution known as Advanced System Repair you could check out to fix it. 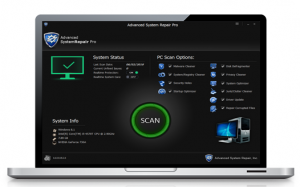 This program is a useful tool that could repair corrupted registries and optimize your PC’s overall performance as well as resolve Blue Screen of Death errors. Moreover, it also cleans out your computer for any junk or corrupted files that help you eliminate any unwanted files from your system. This is basically a solution that’s within your grasp with just a click. It’s easy to use as it is user-friendly. For complete set of instructions in downloading and using it, refer to the steps below. Type in the URL address in the Run dialog box and then tap Enter or click OK.